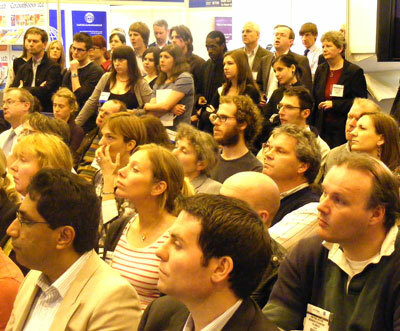 The iPad was the favorite attraction at the London Book Fair Digital Zone last week. "This is a really good eReader," said James Macfarlane from EasyPress. "It has got five fonts." His general point was that publishers will have to forget about complex typography when offering titles on e-readers. They will be able to show text in a continuous flow with limited display options. Apple products offer video and animation in other formats but the standardization requirements for electronically published material limits apple to similar page design as on other devices. Macfarlane also claimed that Digital Rights Management (DRM) would eventually be seen as impossible in a cloud publishing world. He claimed that any undergraduate from a modest university would be able to break the current security. Hazel Woodward from Cranfield University reported on a survey of student opinions on e-books by JISC, a UK academic organization. The summary point on the slide was "Get Rid of Digital Rights Management". Because of ash from a volcano in Iceland many flights were cancelled and the London Book Fair seemed less active than usual. The UK booktrade is only part of the event, many publishers just discuss rights with each other. Michael Smith from IDPF, the organization for digital publishers, was unable to attend this year so his presentation was cancelled. 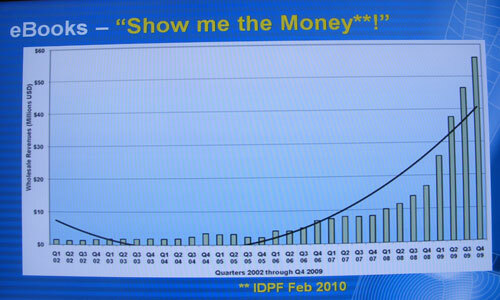 However Macfarlane showed a slide of sales based on IDPF research and he did the year before. The Digital Zone has expanded in space to allow more conversation. There was more seating and much more space for the presentations although the audience still took up some space in the passageways. The Digital Zone is sponsored by Sony and Omar Gurnah, UK Marketing Manager for the Sony Reader, took some of the time that Michael Smith would have used to comment on the eReader scene in the UK. He claimed that Sony is not worried about competition and would welcome the Amazon Kindle in the UK within the next twelve months. The ePUB format, which is a format for free flow electronic books, is based on XML and is able to be optimized to a particular device for optimal navigation of books content. Text and pages are in XHTML, a less forgiving version of HTML which rejects some of the errors that many web browsers can cope with. To address potential technical issues, the companies at the Digital Zone offered services to publishers in moving content across. There are already applications for the iPhone that offer text. Writing in the Bookseller Daily, Maureen Scott from Ether Books pointed out that there are 4.2 billion mobile handsets compared to less that ten million e-book readers such as the Kindle, iPad and Sony devices. The problem she sees is that the average price in the UK for mobile content is ￡2.25, much less than a printed book. The solution that Ether Books offers is a concentration on the short story. There were very few warnings about the strain on the eyes that could follow long periods of time reading from a backlit screen. The dedicated devices such as the Kindle and Sony Reader have a display that is much easier to read. But it is limited to flat pages with none of the excitement that features like moving images provide. The apps approach extends the concept of what a book is. A Disney take on Toy Story for the iPad may introduce the experience of reading continuous text but also features extracts from the movie and a chance to sing along with Randy Newman. There is no guarantee that the existing audience for print media will welcome these sort of features. The Bookseller Daily included an article by Charlotte and Peter Fiell. They recognize that "society is gravitating from a literary to a visual culture". But they still would like to see a role for the traditional illustrated book. At a meeting on digital challenges facing libraries, Martin Palmer from Essex County Libraries mentioned the benefits of digital when faced with sudden large scale demand to texts required for homework. 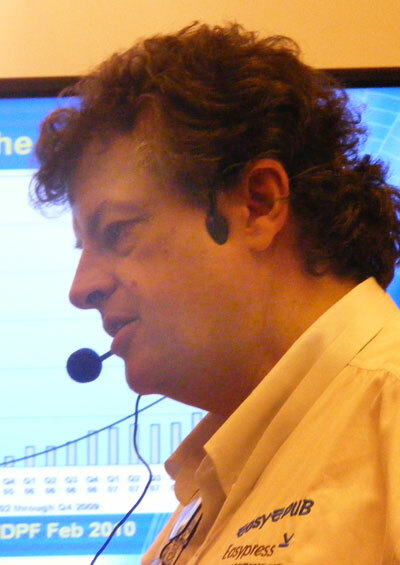 He also mentioned that people are confused by digital rights and the variety of formats. He welcomes the apparent trend for ePUB support and sees the iPad decision to standardize ePUB as a "step in the right direction." At the same meeting Hazel Woodward from Cranfield University was much more explicit about the disadvantages of digital rights management. The JISC national e-books observatory project is based on surveys and interviews with UK students at many universities. The website has a full report and links to deep analysis. 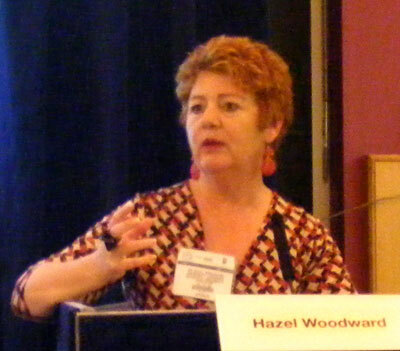 Woodward emphasized the concern with digital rights and pointed to experiments by Bloomsbury Academic and other publishers to explore alternatives. Frances Pinter from Bloomsbury has argued for a model in which a "plain vanilla" version of texts would be available for free while libraries would pay extra for the equivalent of fancy toppings. Her presentation from Tools Of Change is available on YouTube. The JISC site features a report on Tools of Change in New York and suggests looking at Kirk Biglione's presentation on digital rights. This is available at Slideshare and as a video. Biglione compares DRM for publishing with the experience in the music industry. The Microsoft software called Plays For Sure did not survive the availability of MP3 without DRM. Biglione compares this with the current offer from Adobe. Perhaps because of the limits on air travel, there was no Adobe contribution to the London Book Fair this year. There might be some doubt about the future of DRM. Biglione suggests that Amazon may support ePUB at some point in the future but probably with another form of DRM to add to those from Adobe and Apple. Journal publishing has now moved almost entirely online. At a meeting organized by Oxford Brookes University, it was suggested that the print option may be lost in an increasing number of cases. There was concern about the dangers of a "green open access" possibility in which nobody would pay for content. For science and technology there is now an established model where authors can pay for the production costs of journals that are then available for free online. The protection of content was defended as costs are thought to be low. In the UK the average charge for a download is now 70 pence. However the British Library charges a casual user on their website about ￡25 which is similar to other websites. It was suggested that this comparison is reasonable considering the volume involved. In my opinion the contrast is not likely to encourage public access to research, especially for humanities and social sciences where open access is rarely funded. There was some discussion on Deepdyve, a service that offers article rentals for 99 cents. I checked at various stands including Oxford University Press but found there was no awareness of Deepdyve. Deepdyve's blog reports that MIT and the University of California Press recently joined. Perhaps UK publishers will become involved at a later time. Unlike last year there was no stand for Scribd, the social networking site for documents. I found there was limited awareness about Scribed from journal publishers at the London Book Fair. Scribd have improved their systems for avoiding copyright infringement and made arrangements with some major U.S. publishers to feature extracts and promotional samples. They also offer to charge for some titles, but so far only to publishers based in the U.S. The view on social media from U.K. publishers could only improve if Scribd extended their offer. The Bookseller continues as a weekly printed magazine but has also launched the new website - Futurebook.net, close to a blog format with invitations to retweet your favorite items. Sam Missingham introduces himself as "chief Twitter'er for @thebookseller (not my actual job title, sadly)." 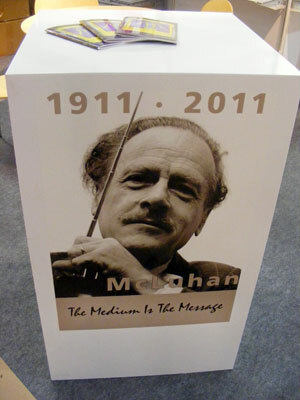 One thing I discovered about forthcoming titles is that Marshall McLuhan will be repromoted next year, a hundred years after his birth. If the Bookseller is putting energy into 140 characters at a time, what will this tell us about the book trade? There was a new area for promoting graphic novels and comics. A meeting considered digital options as most suitable for this area. Already there are Apps for the iPhone such as a biography of Johnny Cash from SelfMadeHero. Emma Hayley explained that the printed book is priced at ￡14.99 but the app is ￡2.99 or ￡1.19 for each of three chapters. The panel accepted that this is the sort of pricing that is suitable for the environment. The Flurry blog has reported that there was a rapid rise during late 2009 in Manga available for the iPhone in Japan. A single publisher is releasing five Manga books a day. "We can expect this kind of content, well suited for the iPhone to continue to expand faster than Godzilla stormed Tokyo." Flurry also reports that Apps in the books category sold more than for games category since September. Next month at IPEX, a print show in Birmingham UK, Frank Romano will chair a discussion on whether the new devices will kill print media. It is very unlikely that print will suffer a sudden death but it is not too soon to discuss the rise of new digital book formats in the future.